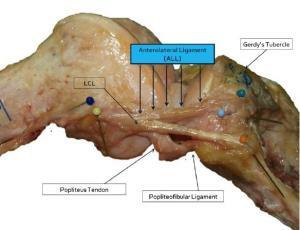 The prominence of the lateral femoral epicondyle, slightly anterior to the origin of the lateral collateral ligament. Connecting fibers between the two structures have been observed. Oblique course to the anterolateral aspect of the proximal tibia, with firm attachments to the lateral meniscus, thus enveloping the inferior lateral geniculate artery and vein. On the anterolateral tibia, grossly located midway between Gerdy's tubercle and the tip of the fibular head. Definitely separate from the iliotibial band (ITB). Given its structure and anatomic location, the ALL is hypothesized to control internal tibial rotation and thus to affect the pivot shift phenomenon.